One of our Windows VPS customers was unable to connect to mysql db with ASP.NET application. In order to fix this issue, we have added connector for ODBC 5.x DSN on Windows VPS as follows. On the Start menu, choose Administrative Tools, and then click Data Sources (ODBC). Open the ODBC Data Source Administrator. To create a System DSN (which will be available to all users), select the System DSN tab. To create a User DSN, which will be unique only to the current user, click the Add button. Select the ODBC driver for this DSN. 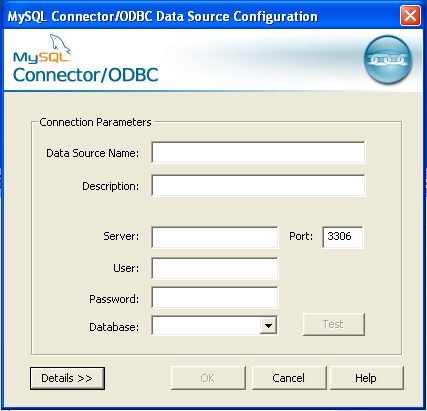 Select MySQL ODBC 5.x Driver for the appropriate level of Connector/ODBC, then click Finish. You now need to configure the specific fields for the DSN you are creating through the Connection Parameters dialog. In the Data Source Name box, enter the name of the data source to access. It can be any valid name that you choose. In the Description box, enter some text to help identify the connection. In the Server field, enter the name of the MySQL server host to access. By default, it is localhost. In the User field, enter the user name to use for this connection. In the Password field, enter the corresponding password for this connection. The Database pop-up should automatically populate with the list of databases that the user has permissions to access. To communicate over a different TCP/IP port than the default (3306), change the value of the Port. Click OK to save the DSN. To verify the connection using the parameters you have entered, click the Test button. If the connection could be made successfully, you will be notified with a Success; connection was made! dialog. Do you know what kind of database connectivity we do offer? Please take a look at this URL to know more. How do I connect to MySQL server from phpMyAdmin? How to change phpMyAdmin password? How to Allow Remote Connection to MySQL Server in Windows? How to Stop and Start MySQL Service in Windows and Linux VPS?